It was one of those surreal moments that happens when you work in a school when on Monday I went from completing paperwork in my office to watching P7 run around Calton Hill, wrapped in foil blankets, creating performance art with headpieces fashioned from plastic packaging. And that’s when Prue Leith walked past. I’m not sure what she thought was going on (and I’m still not even sure) but I’m convinced she enjoyed the ‘showstopper’ performance of George Ezra’s ‘Shotgun’ by 2 of our most enthusiastic artistes. P7 were on the hill as part of our ongoing collaboration with the Collective Gallery and as a class, they have had a special role in the redevelopment of the site since they were in P3. If you haven’t been up recently, you will discover a regenerated site with a gallery, monuments, cafe, restaurant and incredible panoramic views of Edinburgh, Fife and the Pentland Hills. Back at school, we had a visit from Angela Mitchell from Changeworks who had been inspired by our decision to ditch plastic straws following our ‘Make a Difference’ assembly project back in September 2018. She helped us work out which plastics it’s okay to use and which we need to stop. Luckily, we’re already on the road to being as plastic free as possible and Angela gave us even more motivation to be Zero Waste Heroes by following the most important of the 3 Rs which is to REDUCE. She was pleased to hear that Abbeyhill will definitely be a plastic red nose free zone for Comic Relief 2021 (and we’ll work out an alternative if there is any single use plastic on offer for Sport Relief in 2020). On Monday, Mrs Lyall and Mrs El Sarrag ran their last ‘Families Connect’ session and a very special visitor came to present the certificates – Hearts Captain Christophe Berra! Even the most diehard Hibs fans were a little starstruck and Mrs Lyall was in heaven! Christophe was there as the programme is run through Save the Children who are partnered with Hearts FC. Thank you to all the families who came each week, we hope that you enjoyed it and took some useful information home. Well done to the winning family who will be going to the zoo! On Wednesday, we had 10 Croatian Head Teachers visit every class and then meet with me to discuss curricular reform. The Croatian education system is undergoing a radical change and moving to a child centred curriculum that will be similar to the Scottish Curriculum for Excellence and it was fascinating to compare and contrast our experiences in school. We also had Parents’ Evening this week and thank you to all of the parents who took time to come and visit us on Tuesday and Thursday. It’s great to catch up and let you know about all the great things that your children are doing in school and it’s also a chance to hear about all the great things that they’re doing at home! To round off the week, P4 and P6 held a craft fair as part of their Virgin Money ‘Grow a Fiver’ project. They each had £5 to buy materials and create something to sell with all profits going to camp (P6) or to buy more craft materials (P4). Scented candles, bows/bowties, mint lip balm, badges and wildflower seeds have been magically produced, with only one glue gun related injury (don’t worry, it was only Mrs Flowers). At an early count, nearly £300 had been raised by P4 alone so well done and thank you to everyone who supported them! So all in all, it’s been another busy but successful week at Abbeyhill. Check in next week to hear all about P6’s trip to Edinburgh Castle and my re-scheduled meeting with Mrs Lansdown! But the big question will be….have the newborn chicks that have hatched in the Nursery week survived a weekend of chicksitting at Mrs Ketchin’s house?! Fingers crossed! 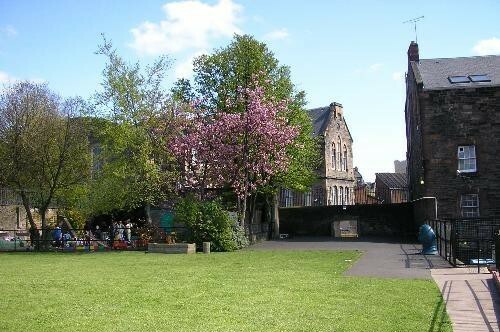 This entry was posted in Fundraising, Head Teacher's Blog, P7, Parental Involvement, Parents, Primary 4, Primary 6, Primary 7, Uncategorized and tagged Community, Families Connect, Fundraising, Head Teacher's blog, Plastic Free Abbeyhill on 22/03/2019 by S Ketchin. Have you got that Friday feeling? …which for us is happy exhaustion! It’s been an incredibly busy week at Abbeyhill with the Talent Show, Euroquiz, World Book Day, plenty of cooking and a soundscape! Read on to find out more. Last night saw the Parent Council Talent Show which was a fantastic celebration of a diverse range of talent, taste in music and interests. We had a ventriloquist, a berimbau performance, Highland and Scottish dancing, a poetry recital, stand up comedy, ballet dancing and lots of amazing singing. It was a wonderful celebration of all the things that make us unique as well as the things that bring us together; happiness, laughter and good times with friends and family. Thank you to the Parent Council for the many months of organisation and planning that went into a very well organised event that was enjoyed by everyone who attended. Thank you also to Russell McLarty for hosting us at Meadowbank Parish Church. The whole event was filmed so I’m sure copies will be available before too long! On Monday, Mr Hamilton took 4 P6s to the City Chambers to take part in Euroquiz 2019. They spent week practising and came a very respectable 14th out of 24. Congratulations to the teams from Sciennes and James Gillespie’s who will go forward to the national event. It was a great opportunity for us to see inside a building we’d normally only walk past as well as a chance to represent Abbeyhill at a citywide level whilst also meeting P6s from other schools. Well done Team Abbeyhill! On Wednesday, P2 had a very special visitor (Miss Stephen’s mum!) who is a trained chef and helped them to make delicious carrot and apple muffins in the Cooking Classroom. Everyone got a chance to weigh, measure, stir and most importantly, TASTE! Our Cooking Classroom is being really well used thanks to our Food for Thought grant and the P7s cook (or prep!) up a storm most days to keep our healthy tuck shop going. Our Food Champions met with colleagues from our local LIDL store who popped in yesterday with some exciting offerings…a George Forman grill, a Nutribullet and plenty of tupperware for all our culinary handiwork – thank you to LIDL! As part of our World Book Day celebrations the children participated in a “Where’s Wally” hunt in the playground. Everyone had to find Wally and either crack a code or answer book related questions. It was great to see the children searching so enthusiastically- some light rain didn’t stop the fun! The winners will be announced at Monday’s assembly. In the afternoon Mr Martin held a whole school World Book Day assembly where we played charades, unscrambled book titles and guessed the hidden book character. The assembly ended by watching the animated version of the popular story “The Very Hungry Caterpillar” by Eric Carle. The assembly was a great chance for everyone to share the fantastic book related activities they had been doing in class. On Wednesday evening, our Curator in Residence, Iliyana, co-hosted a very special meeting in school with Citadel Arts Group where anyone who has been involved with Abbeyhill at any point in their lives was invited to come in and share their stories. Together with P4 and P6 they will work to transform these living memories into a book and a binaural soundscape to be premiered at Colony of Artists 2019 (21st and 22nd September). Don’t miss it! Next week it’s RED NOSE DAY! Everyone has been getting very excited about the official red noses that have been on sale in school and these will continue to be available next week. It’s also an optional dress down day on Friday with a suggested donation of £1 for Comic Relief. It’s also Parent Council on Wednesday from 6.30pm and bookings are now open online for Parent’s Evening on 19th and 21st March – check your inbox for the link! Phew, that’s it for this week – have a good weekend everybody! This entry was posted in Artists in Residence, Head Teacher's Blog, Parent Council, Parental Involvement, Parents, Primary 2, Primary 6, Uncategorized and tagged Artists in Residence, Colony of Artists, Comic Relief, Community, Euroquiz, Parent Council, Talent, World Book Day on 08/03/2019 by S Ketchin.